I don't know about you guys, but it's been HOT all week here. I'm talking weather advisories, can barely breathe when you go outside, need multiple pairs of underwear in one day hot. We normally get heat waves like this, but only for a few days, not a week at a time. There's supposed to be some big thunderstorms this weekend so hopefully that will cool things down a bit. In the meantime, it's way too hot to cook. But... I still need to eat! I've been seeing a few different variations of this BLT salad on Pinterest and decided to make my own. 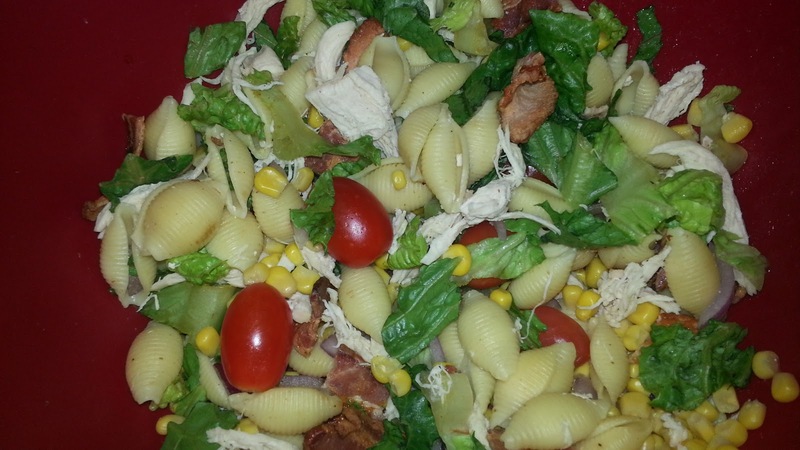 It's delicious and the pasta makes it more filling than a regular salad. Okay, so you do have to do a little bit of cooking for the bacon and the pasta (yes, it's been too hot to even boil water), but I promise you it's worth it. I made a huge bowl of this and have been tweaking it every day so that I don't get sick of it, and it just keeps getting better as the flavors get to know each other better. Plus, I like this recipe because it's easy to adapt and add or remove things you don't like without totally changing the flavors. Joe's not a huge salad person, but he loved this one! Although to be fair, I think he'd eat anything as long as it involved bacon. 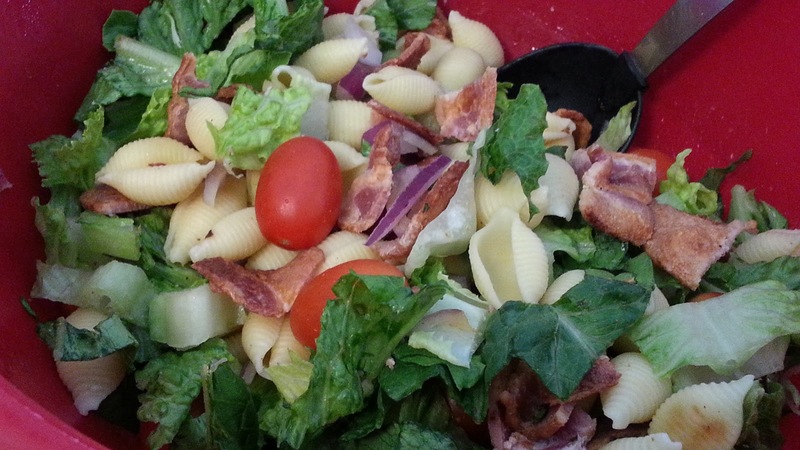 No real recipe for this one, since it's pretty simple: romaine lettuce, tomatoes, bacon, red onion, pasta of your choice. Toss is all together. If you know it's all going to be eaten, top with ranch dressing in the bowl. Otherwise, serve in individual-sized bowls and top with dressing. As you can see from the photos, to mix it up, I also added some corn and some shredded chicken. Yum! I'm a little behind on my blogging. I'm also a little behind on my baking. Let's blame Mother Nature for both, shall we? Living in Massachusetts, it's difficult to bake as much as I like to when it's 95 degrees and humid outside and 85 and humid inside. Even with the AC on, baking in the summer is a challenge - is what I want to make worth heating up the whole apartment? Will it even come out right because it's so humid? I do most of my summer baking first thing on Saturday or Sunday mornings or later in the evenings, since that's when it's coolest. As a result, my posts will probably be slowing down from now until about August/September (when I can't take it anymore), but I do have some awesome no-bake and summery baked recipes that I'm dying to try (watermelon cookies - I'm looking at you!). Anyhow, here's something I made a couple of weeks ago that's really perfect for this type of weather and the summer season. 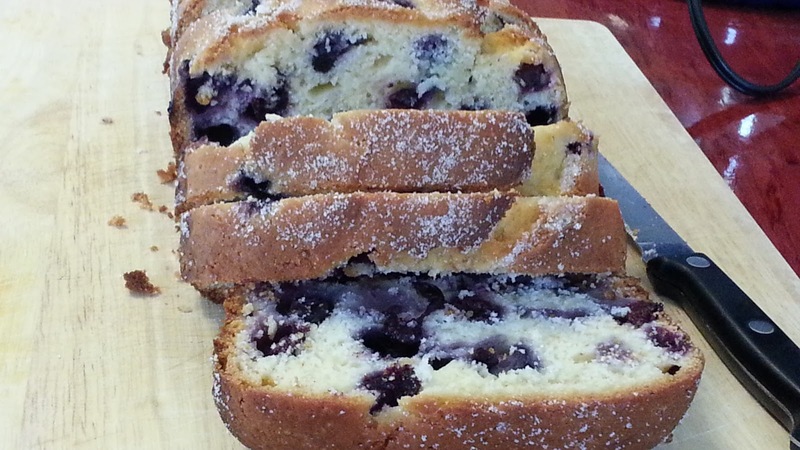 Blueberries are in their prime right now, and the light and airiness of this bread really lends itself to a lot of combinations: you can easily serve this by itself or with a scoop of ice cream and/or whipped cream and either more fresh blueberries or other delicious fruits. 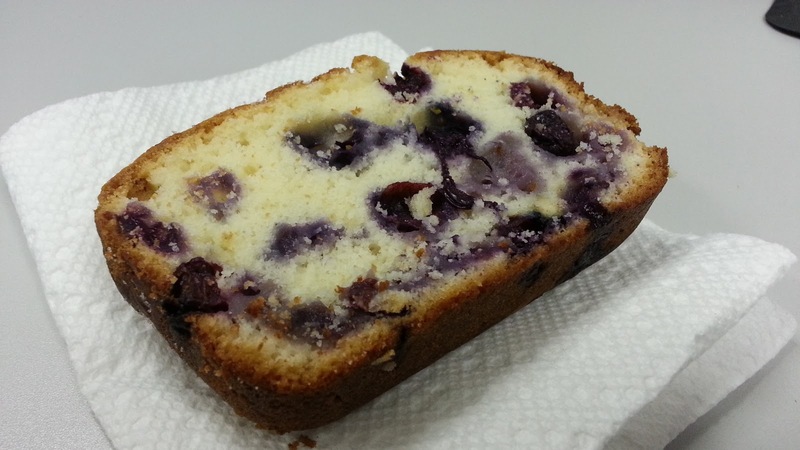 I actually made this twice, as the first one barely made it into the door at work before it was devoured. The second one, Joe and I took our time and savored - then used the rest of it to make french toast, which I will blog about later. For me, one of the most surprising things about this bread was my brother's reaction. Now, I love this kid, but holy hell, he can be really picky sometimes. My favorite thing to do is say, "Josh, do you like _____?" And, when he says, no, I make it any way. Sometimes, he still doesn't like it, but more times than not, he ends up going back for a second or third helping. He came over after I made this and we ended up just missing each other because I had to work late and then run a couple of errands. He sent me a text that said he doesn't like blueberries, but the bread was delicious. Further proof that you don't know you like something until you've actually tried it (PS: Hi Josh)! What I loved about this recipe is that it's so easy to make. If you're planning to make it for a party you're having, it's an easy thing to whip up the night before OR the day of, and as long as you put it into an airtight container or cover it good with foil, nobody will know! 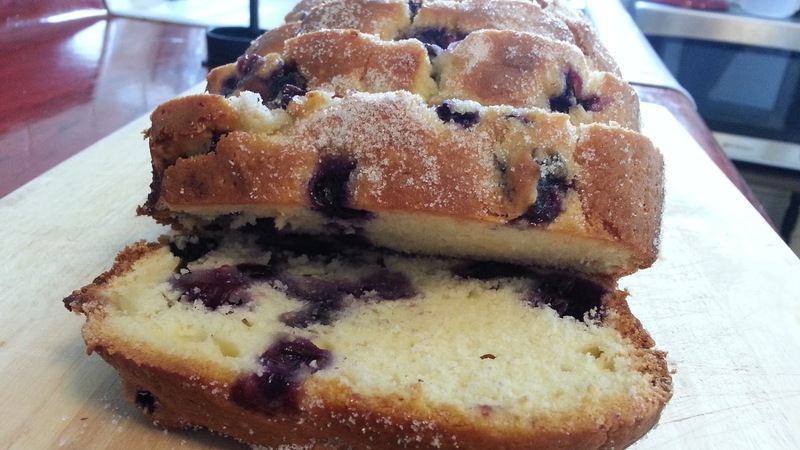 I also really like how the blueberries are perfectly mixed in. I decided to sprinkle the sugar on top because while it was baking, the smell made me think of blueberry muffins, which are my absolute favorite. I like adding the sugar on top partway through the baking process because then you still get the sweet taste to compliment the tartness of the blueberries, without the sugar crystallizing too much while it's cooking. I'm a huge fan of fresh berries - and tend to buy way more than one person can reasonably eat - so this is an excellent summertime recipe that will give you something sweet to munch on without being too heavy. In a medium sized bowl, combine butter and sugar. Add the eggs, one at a time, beating well after each one. Add the flour, baking powder and yogurt. Mix until everything is incorporated. Carefully fold in the blueberries, being careful not to overstir and not to crush any blueberries. Scoop batter into prepared pan, using the back of a spoon to gently even it out, if necessary. Bake for 30 minutes and remove bread from oven. Sprinkle about 1 Tbsp of sugar on top, then return to oven for approximately 30 more minutes, until golden brown and a toothpick inserted in the center comes out clean. When bread is finished baking, let cool in pan for about 10-15 minutes. Gently run a knife around the outside edge. Carefully invert onto a plate or cutting board and move to wire rack to cool completely. Yields 10-12 slices, depending on thickness.